Tim Russell and Rohan Sali have the sort of friendship you only get from a long association. While both young men are working in key positions at Greater Shepparton City Council, it was actually as boys that they first met in Year 7 at Goulburn Valley Grammar School. After graduation from GVGS in 2009, Rohan did a Bachelor of Business at La Trobe University, majoring in international marketing and finance, including time at Central University in Beijing, China. During his final year he undertook an internship at Greater Shepparton City Council as part of a unit on economic development. He also worked in council’s marketing and communication department during his university holidays for two years. When his mentor –Team Leader, Business and Industry Geoff Hay – left council, Rohan was asked to fill in, which led to him securing the lesser role of Economic Development Projects Officer, which he did for five years. He was recently promoted to his current position. Rohan’s well-known Sali family is of Albanian heritage, although Rohan only visited Albania for the first time this year. He is an active member of the Shepparton Albanian community and helps organise the annual Shepparton Albanian Harvest Festival. Rohan married Yaas two years ago. The Sali family business is based around a large apple, pear and stone-fruit orchard on Verney Road (so Rohan grew up the road from GVGS) and it also includes the stores Traffik, Arcade Fashions and Shop 221, all in central Shepparton. Tim had contacted Rohan a year earlier about possible opportunities and was following news reports about the challenges faced by retailers in the Shepparton CBD. “Tim caught up with me before the role was created,” Rohan said. “I said, ‘What they really need is someone to run this part of Shepp!’” Rohan’s role at the time involved him doing “bits and pieces” in that area, but nothing really focused. “It was a really, much-needed position,” Rohan said. Very much part of the equation was Tim’s high-school sweetheart Georgie Prentice, whom he started dating in Year 10. After studying both criminal justice administration and then switching to early childhood education, Georgie was also keen to get back to the country. “We always said they’re the couple who will get married,” Rohan said. Tim and Georgie tied the knot in 2017 and are expecting their first child this Christmas. Today Tim and Rohan have their desks in the same area at Welsford St. “It helps having the history and the respect for each other,” Tim said. Rohan said both men had been imbued with “great principles” at GVGS and “when we talk we are on the same page”. Both men maintain contact with several teachers, with Tim particularly mentioning his history teacher Dr Darius von Güttner. “He opened a lot of kids’ minds as to what is out there in the world,” Tim said. Tim and Rohan were both members of Fairley house and say their school years were Fairley’s “glory years”. They said fellow student Paul Bugoss was also in Fairley and an amazing swimmer who “won everything”. Paul is now a teacher at St Augustine’s in Kyabram and Tim and Rohan work with Paul’s father Steve at council. Other students in their year level working locally include Jayne Young at MB+M and musician Matt Head. Rohan, now 27, was the youngest of three boys in his family to attend GVGS. Nathan, 29, runs signwriting business GV Signs and Shane, 31, who left GVGS in Year 10 to go to another school, works in the family business. Tim’s family is no less well-known in Shepparton: Tim’s parents Ursula and Glen are both doctors at Shepparton’s Lister House Medical Centre. Glen was a well-known GP obstetrician for many years, delivering an amazing 1500 babies. 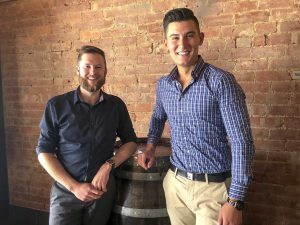 Tim’s brother Lachlan, 26, works at Advance Computing, a Shepparton and Kyabram-based software developer and Nicholas, 24, works in hospitality in Melbourne. Tim and Rohan are great advertisements for young people staying in or coming back to Shepparton. Tim said around the time he and Rohan left school there was a real stigma attached to growing up in Shepparton. Both men believe this has improved in recent times. “Even when I was going to come back people would still ask me, ‘Why would you go back there?’ For me, the position was a unique opportunity to contribute to making it better. For our demographic, there are opportunities everywhere but it is more so a lifestyle change,” Tim said. It used to be a case of people being ‘pushed’ out of Melbourne, Tim said, but now there are many ‘pull’ factors in Shepparton such as great cafes and restaurants, events, sports facilities and housing affordability. Rohan said he sees huge potential for the future of the Goulburn Valley. “A lot of the businesses here employ so many varied professions,” he said. “For example on a farm there isn’t just the farmer but the whole back end from accountants to technical and marketing people.” Both Tim and Rohan said they encouraged other former students to think about moving back.